It became known as the “Judgement of Paris”, perhaps the most famous wine tasting in recent history. In 1976, a British wine enthusiast named Steve Spurrier set up a competition between the best of California’s Chardonnay and Cabernet wines against wines from France’s Bordeaux and Burgundy. California wines won in both categories as determined by the panel of 9 French judges. Needless to say this rocked the wine world and put California’s Napa Valley winemakers on the world stage. For our visit to Napa Valley we parked at the Skyline Wilderness park located on the south side of the town of Napa. We did some wine tasting but mostly we visited some of the more interesting wineries, notable for their architecture or art or the view. Among those we visited: Beringer, Hall, Inglenook, Chimney Rock, Monticello, Andretti, Del Dotto, Darioush and Artesa. We also poked around the towns of St. Helena, Yountville and of course, Napa. 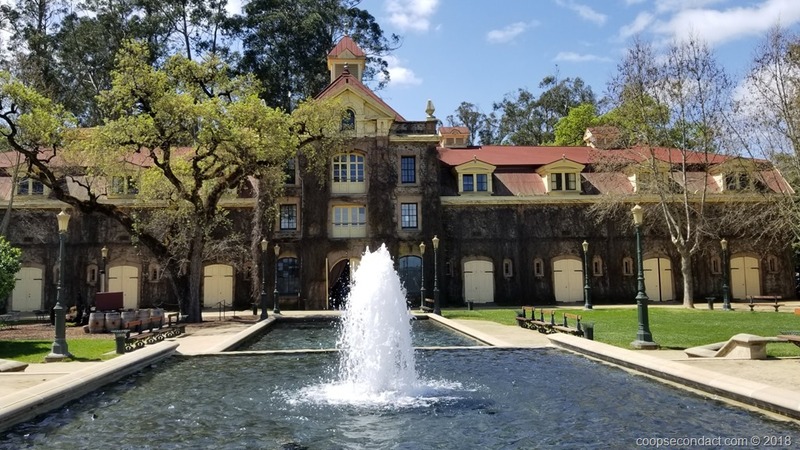 One of the more interesting winery stories is that of Inglenook. In 1879, Finnish sea captain Gustav Niebaum came to Napa Valley to build a wine estate that would rival Europe’s finest. He purchased the Inglenook farm and did just that. By 1887 he had begun wine production and completed a grand chateau. After his death, Niebaum’s grandnephew took over the estate. Wine production was halted during prohibition but was restarted in 1933. They were making award winning wines but not earning any profits. In 1964 the winery was sold. In 1975, Francis Ford Coppola purchased a portion of the property that included the chateau and set about restoring it to its former glory. Indeed he also returned the winemaking to award winning greatness. Over time he reassembled the original parcels of vineyards and in 2011 returned the Inglenook brand to the winery. I am going in July. Can’t wait! !